Do IZ policies have the potential to promote IZ recipients' social inclusion through residential access to the amenities that many low-poverty neighborhoods and schools provide? What program-design aspects shape the potential to meet the goals of providing affordable housing to low-income households and promoting social inclusion for IZ recipients? Inclusionary zoning (IZ) has become an increasingly popular tool for providing affordable housing in an economically integrative manner. IZ policies typically require developers to set aside a proportion of units in market-rate residential developments to be made affordable for lower-income households in exchange for development rights or zoning variances. These policies are considered "inclusionary" because they are intended to allow lower- and moderate-income households to buy or rent property in middle- and upper-income communities. This report examines 11 IZ programs across the United States to determine the extent to which the policies serve lower-income families and provide IZ recipients with access to low-poverty neighborhoods and residentially assign them to high-performing schools, thereby promoting the academic achievement and educational attainment of their children. It also considers ways in which IZ policies vary and how different design features might affect the success of the programs in promoting affordable housing and social inclusion for IZ recipients. Finally, it identifies key program-design aspects that shape the potential to meet the goals of providing affordable housing to low-income households and promoting social inclusion for IZ recipients. Compared to other affordable housing programs, IZ programs provide its recipients with greater access to low-poverty neighborhoods, which are often correlated with high-performing schools. IZ programs tend to serve low-income people. IZ programs tend to serve owners rather than renters. IZ homes tend to be dispersed throughout jurisdictions with IZ policies rather than concentrated in a few neighborhoods. A large majority of IZ homes are located in low-poverty neighborhoods. IZ homes are residentially assigned to relatively low-poverty public schools. IZ homes are assigned to schools performing better than schools in the same jurisdiction that do not serve IZ homes. Care should be taken in developing IZ program features, because these features influence the degree to which IZ policies can increase the supply of affordable housing and include participating families in their communities. This report was sponsored by the John D. and Catherine T. MacArthur Foundation and was conducted in the Environment, Energy, and Economic Development Program within RAND Infrastructure, Safety, and Environment, a division of the RAND Corporation. 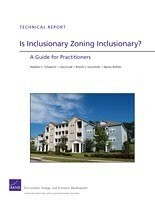 Schwartz, Heather L., Liisa Ecola, Kristin J. Leuschner, and Aaron Kofner, Is Inclusionary Zoning Inclusionary? A Guide for Practitioners. Santa Monica, CA: RAND Corporation, 2012. https://www.rand.org/pubs/technical_reports/TR1231.html.